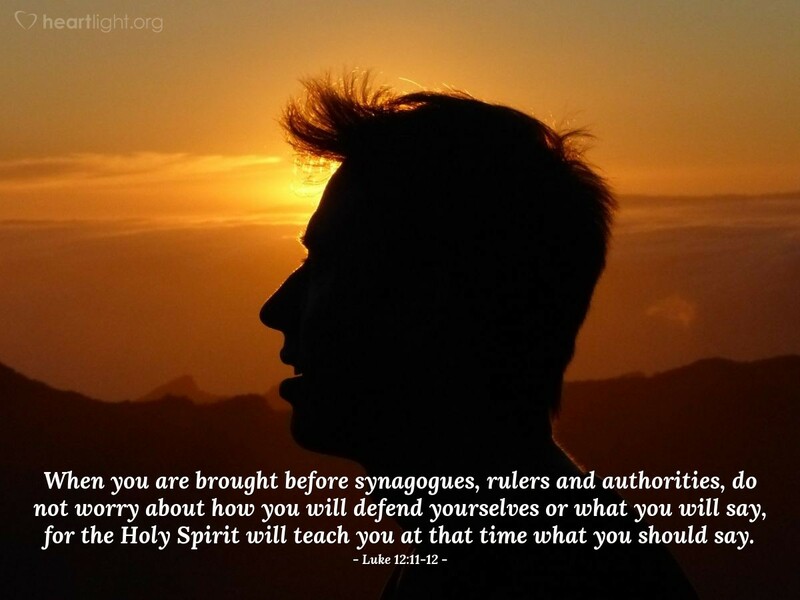 When you are brought before synagogues, rulers and authorities, do not worry about how you will defend yourselves or what you will say, for the Holy Spirit will teach you at that time what you should say. When we need help most, Jesus promises he will be there and will send his Spirit to give us the words we need. Throughout the centuries, this promise has sustained those facing persecution and ridicule. It helped them realize that they were not alone and that they didn't need to worry about having the perfect answer to everything going in to face a hostile audience. This same promise sustains Christians today whether they are under governmental persecution or facing the hostility of unbelievers in the workplace, at school, or at home. When facing our enemies, we know we are not alone; our Savior goes with us. Loving God, I need your strength and the Holy Spirit's help as I speak with those who are opposed to your message of salvation. I want your words, not mine, to be what others hear in that crucial moment of confrontation. Please give me wisdom to know when to speak, what to say, and when to remain silent. In Jesus' name I pray. Amen.